As a company with an extensive network of partners, we are very proud of our channel-driven model. Partners are at the core and the heart of our business. We have different categories of partners engaging with us today, from System integrators, resellers, Service Providers, Telco’s, CRM and ERP specialists to ISV’s. With each one, we strive to build a strong relationship that will benefit both sides in long term. Our partners maybe have different profiles and special requirements, but we have many aces up our sleeve that can be perfect answers to many questions our partners ask before entering a partnership. 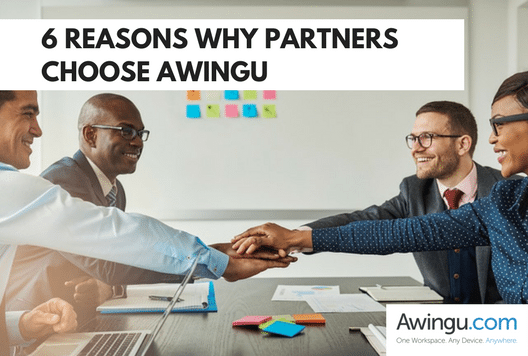 If we sum up the most important reasons why partners choose Awingu, they actually tell a lot about the pure basics our solution and company runs on. 1/ We focus on long-term partnership built on mutual trust, without channel conflicts. 2/ We let you keep control over the technical deployment. 3/ We help you maximize margins and minimize time-to-market. 4/ We bring you innovation. 6/ We help you transition your business to the Cloud. Interested in becoming an Awingu certified partner? Contact us and let’s see together how you can improve your business.